This stylish Sci-Fi horror from David Cronenberg’s son offers some serious food for thought and is flattered by performances from promising rising stars, but there’s something about Antiviral that leaves a bit of a bad taste in the mouth. In his feature debut, Brandon Cronenberg (son of director David) writes and directs this unsettling Sci-Fi, which presents an exaggerated portrait of what society’s obsession with celebrity culture might look like in the near future. 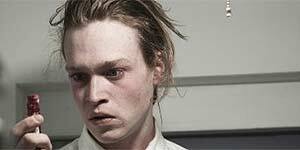 Caleb Landry Jones stars as Syd March, a young salesman working for The Lucas Clinic, a corporation that offers its clients the chance of experiencing real intimacy with their favourite celebrities by injecting them with live viruses taken from sick stars. In a bid to make an extra income, Syd has developed a dangerous habit of smuggling viruses out of the clinic in his own body to sell them on the black market. But when blonde superstar Hannah Geist (Sarah Gadon) is announced dead, Syd realises that the virus inside him will eventually kill him too and must frantically solve the mystery of Hannah’s fatality before his rapid deterioration causes his own death. Proving that the apple doesn’t fall too far from the tree, Brandon Cronenberg presents a stylish, yet disturbing, horror with an interesting and thought-provoking concept that on this occasion challenges and questions society’s obsession with celebrity culture. It’s all quite tongue-in-cheek and handled audaciously, yet carefully, and the overall result undeniably leaves a long lasting impression long after the lights go up. Rising star Caleb Landry Jones (who’s tipped to star in the next X-Men instalment) is well cast as the hopelessly obsessed Syd, lending a noticeable chill to his performance with his almost obsessively sinister whisper and striking, gaunt complexion. Finally, Sarah Gadon (who was last seen in David Cronenberg’s Cosmopolis) as the tragic beauty Hannah Geist is notable, lending a unique performance and proving great potential as an alternative Hollywood star. Despite its interesting concept, there’s something about Antiviral that leaves a bad taste in the mouth. For a start, it’s not as wholly entertaining as it thinks it is and in truth, certain bits of the film are a bit of a slug. Where Cronenberg makes his biggest mistake though, is in the character development. The film’s leading protagonist Syd is simply not likeable enough for the audience to root for his survival and the supporting cast offer little in the way of captivating characteristics. Finally, the many scenes involving injection close-ups and stomach-churning blood gags will not go down well with the faint-hearted. With its character flaws and uneven tone, Antiviral is certainly not perfect, but Brandon Cronenberg shows great potential with this original and thought-provoking film. Worth seeking out.